Kyle is joined by the Tokusatsu Network’s Paula Gaetos to recap the wonder of Japan World Heroes. Photo taken at Monsterpalooza 2017 (Not really pictured: Kaiju Kingdom Podcast’s Chris Eaton). For this episode I am joined by The Tokusatsu Network’s Paula Gaetos. I thought that it would be a big advantage to have a die-hard fan of the genres represented at the convention help me fill in the gaps (of which there were a LOT!) in describing how cool it actually was to have so many amazing guests at Japan World Heroes. 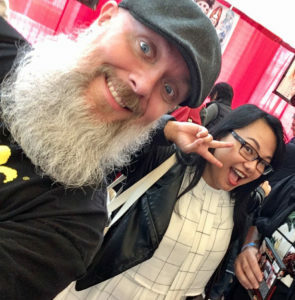 If you haven’t listened to the interview with Scott Zilner, you might not be familiar with the convention that we’re describing but have no fear, Paula is going to school myself and you listeners in the ways of tokusatsu’s superheroes! Tokusatsu Network Links to look at! If you’re interested in sharing your homework (aka your thoughts questions and reviews) for The Last Dinosaur (1977) please make sure to do so before September 22nd to be part of the upcoming episode!